To stage or not to stage…that is the question! Up until the early 2000’s, most home buyers would have only experienced the eye-popping appeal of home staging if they went and visited a model home at a new construction site. Builders know that it’s much easier for people to make a home-buying decision when they see a home decorated beautifully and set up like someone lives there. These days, staging is highly recommended whether the home is brand new or currently occupied because it has a huge impact on the amount of money that sellers walk away with and can shorten time on market considerably. Now, according to some experts, it can cost you anywhere from $200 – $2,000, depending on how much work is needed, but it’s really worth it as you can often enjoy a 150 to 750% return on your investment. Here are 5 great reasons why you should stage your house before you put it on the market for sale. 1. Likelihood of selling increases. Your goal as a seller is to sell your home fast and for top dollar and staging your home puts you in position to do both. Staging helps you present your home in the best possible light to all buyers, even when they first see it on the Internet. 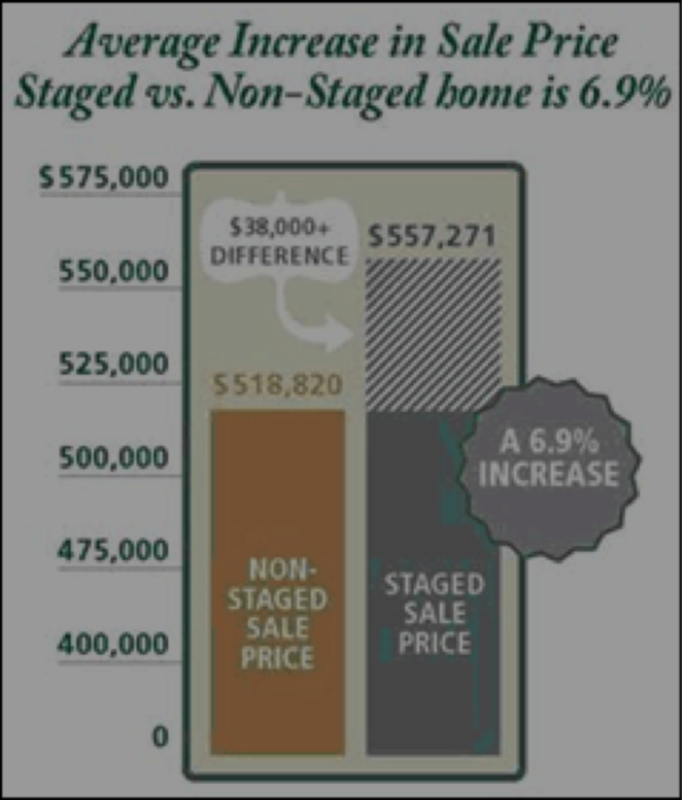 Staging increases the perceived value – and in many cases – the actual value of your home. When this happens, buyers will be more likely to make an offer. There is no question that a well-staged home can increase the likelihood your home will sell. Perception is reality, and when buyers walk through your home for the first time, they are perceiving things based on the observations they are making. Their goal is to feel comfortable inside the home as they are potentially going to live there. And, while they’ll want to make sure that it meets all of their needs, i.e., size, layout, number or rooms, etc., they’ll also be looking for specifics that indicate the true condition of the home. By staging a home effectively, you will give buyers the belief you have a well-maintained home. Staging is a combination of making basic repairs and cosmetic improvements in your home. This is the bare minimum; you fix what is broken. From there, you move on to the cosmetic aspects of staging like painting and decorating. The outcome is a home that looks like it’s in tip-top shape, which it usually is. This puts buyers’ minds at ease, making them more attracted to your home…something you absolutely want. Cluttered houses just don’t show well. And, since you’ll have to pack your belongings in order to move, why not get a head start. In order to stage your house properly, you must remove make your home look neat and clean, something decluttering the home will surely accomplish. As well, you’ll also need to pack away your personal effects to the extent you can so buyers can visualize themselves and their belongings in your house. Oddly enough, staging the home and packing in the process makes your job way easier when it comes time to move. Consider it “packing early”! With all the information available about homes on the Internet today, home buyers have way more information about homes and prices than they ever have. They can see patterns of price increases and decreases in any area, which gives them the opportunity to scrutinize your asking price like never before. However, if you stage your house before you put it on the market, you’ll have a much easier time justifying the price to potential buyers. Remember, there’s a big difference between pricing your home along with the market and then justifying the price itself. Home buyers and their real estate agents will use comparable sales data to determine if your price is on point. But what’s going to help them pull the trigger is how they feel when they walk through the front door of your home. If they see lots of things that need to be repaired or replaced, they may likely feel that your asking price is too high, even if the market data tells another story. The better your home looks, the more likely they will be to make an offer at the price you have set. Whether the market is a seller’s market or a buyer’s market, there is competition between your home and other homes on the market. Your goal as a seller is to compel buyers to choose your home over the other homes on the market. Price: You can always price it below the competition; however, there is no guarantee that they lower price will get you an offer. As well, there’s no sense to price it below the competition or market value unless you really need to sell your home or get some place fast. Staging: Staging is a great way to make your home stand out, even if your home is priced the same as similar properties that are for sale. Through staging, you are giving the appearance of superior value. The key here is to first make sure that your price is on point and then make your house look fabulous so that everyone who walks through it sees (and feels) how incredible your home is with their own eyes. When that happens, you can really get top dollar for your home no matter how many homes you are competing against. The great thing about staging is that anyone can do it. More importantly, it’s not super expensive to do…even if your budget is tight. Sometimes, even just cleaning your home well and taking out the clutter will have a huge impact. If you’d like to find out how to get your home staged for free when selling or if you’d just like some ideas of what you’d have to do to prepare it for sale, click here. Staging is clearly a solid strategy in helping you get your home sold for top dollar in any market environment.